CES 2010: Keith Monks returns to the show after 27 years | What Hi-Fi? The company is celebrating its 40th anniversary with the launch of a special limited edition model, the Ruby. Just 40 of the machines will be made for sale worldwide. The Ruby, which comes with a reproduction of Keith Monks' signature on its control panel, and a signed and numbered certificate, is housed in an exclusive Ruby Red cabinet with a matching cover, and has a range of new features. There's a new VacuGauge dial to monitor the performance of the BBC-spec broadcast standard vacuum system, its chrome rim complementing the Mini Cooper windscreen washer pump control to give a retro look. The unique DewDrop splashguard catches excess cleaning fluid from the revolving turntable, there's a new fluid application system for 7in, 10in and 12in records, and interchangeable discOvery Precision Record Cleaning Brushes also cope with the various disc sizes. The unit comes with a set of three Pyr/Mat cleaning mats, which support the record on pyramid tips, allowing dust and dirt to fall away, and control the spread of excess cleaning fluid. Also being shown are the new discOvery Natural Precision Record Cleaning Fluids, which offer the best-ever clean but are made from botanicals and plant extracts plus distilled water. 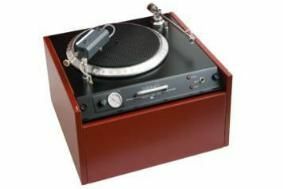 There are specialist fluids for vinyl and shellac discs, plus a pre-wash concentrate to tackle stubborn stains such as the mould discs may develop after years of poor storage. Jonathon Monks says that "America in many ways quickly became the ‘home' of the Keith Monks Record Cleaning Machine – in its 1970s and 1980s heyday more units were sold in the States than almost every other country put together. "I am delighted that after a quarter century the Keith Monks is finally returning to the world's biggest showcase of high end audio, and in the country that has historically embraced us the most."